Santa Claus is finally coming back to town, and he’s not coming alone. In fact, he’s stumbling around San Francisco with a whole group of people who look just like him. Also, he seems to be blackout drunk. While tradition says Santa Claus only comes around on Christmas Eve, for the last fourteen years in San Francisco, a conglomerate of Santa Clauses have been popping up a couple weeks earlier and they’ve all had too much eggnog to drink. The reason for all the belligerent Santa imposters is SantaCon—and it doesn’t only take place in San Francisco. This year, over one hundred cities around the world hosted their own version of this quirky holiday that has caused many headaches for city officials. For the last few years, SantaCon has evolved into an event that produces all out mayhem for the many cities that host the event. Starting at ten a.m., thousands of young adults wander around the city, hopping from bar to bar drinking heavy amounts of alcohol. While for some this seems like an unforgettable time, there are others who would rather not have Santa Claus slumped over on their stoop throwing up in the middle of the afternoon. “It’s a spontaneous event, no one’s really running it. There’s no tickets, there’s no admissions charge so it kind of has a life of its own. Certainly, I think, excessive drinking is discouraged. We’re trying to be good Santas and elves,” said Ralph Torrence, who attended this year’s SantaCon dressed as an elf. 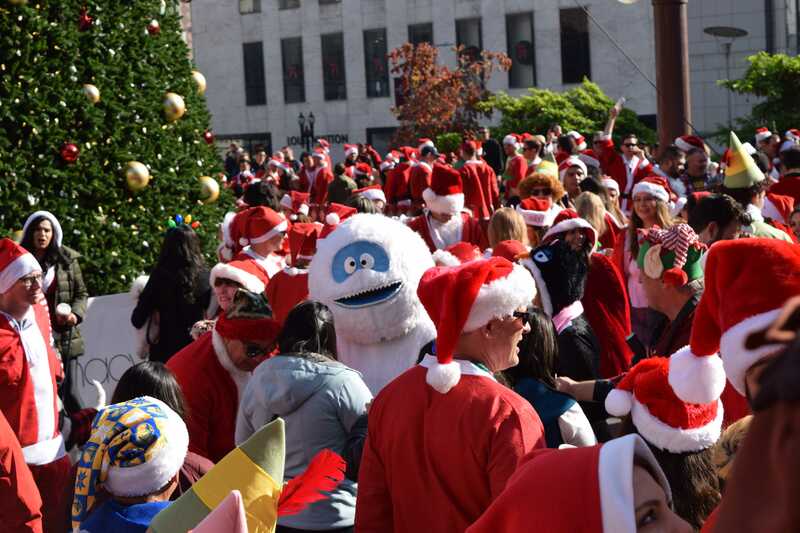 Despite what the event has become today, SantaCon actually originated from a completely different kind of event, one that was re-created by a San Francisco group known as the Cacophony Society in 1994. When looking for the root of SantaCon, you actually have to go all the way back to 1974 in Copenhagen, Denmark. There, a Danish activist theater group known as Solvognen carried out what would become the first ever version of what we refer to as SantaCon today. The group dressed up as Santa Claus and protested consumerism and unemployment. At the peak of their performance, the group raided a department store and started handing out free gifts before eventually being arrested. Essentially, SantaCon started out as performance art, with a purpose of enlightening the public on issues of inequality, and what the group viewed as the absurdity of consumerism. Three years later, in San Francisco, the Suicide Club was formed by the late Gary Warne with a focus on urban exploration and street performances. After Warne passed away at the young age of thirty-five in 1983, The Suicide Club seemed to pass along with him. However, from the ashes of this secret society rose another group, one that would come to be known as the Cacophony Society and also the originators of SantaCon. While the Cacophony Society as a whole is known for starting the event, the idea can actually be traced back to a specific member of the group. The man that started this holiday of sorts is Rob Schmitt or as some people like to call him, Santa Rob. Schmitt explained how the idea originated from a time when he and a group of friends were making salmon costumes for the Bay to Breakers marathon—a race in San Francisco in which all the runners dress up. They were part of a group of people who used to dress up as salmon and run upstream, or from the Breakers to the Bay, against the wave of marathon runners racing towards the finish line. “We were making the costumes for Bay to Breakers and I saw on the floor a postcard that somebody sent from a theme camp at Burning Man where they were all Santas. I thought, wouldn’t it be cool to do this? And that’s kind of how the idea took off,” Schmitt explained. At the next Cacophony meeting, Schmitt brought up his idea to the group who initially laughed it off as nonsense. He describes how people told him it was the worst idea they ever heard. “Honestly that was what made me want to do it even more. That’s how a lot of things got done in Cacophony, from other people saying ‘no you can’t do that,” Schmitt said. Eventually, Schmitt was able to gather a group of about thirty-eight people who were willing to dress up as Santas and join him on his adventure. The group rented out a bus and hit the town for a night of fun. The following year, with the help of another Cacophony member John Law, the group grew larger, with over one hundred people hitting the town dressed up as Santas. That year, members of the group were able to crash the San Francisco Chronicle’s holiday party. Schmitt believes that around 1999 is when the event started to get a little out of hand. He explains how the city of San Francisco began to grow weary of the event, prompting Schmitt and his friends to move the event to other cities. “We took it to Portland because we felt the police here had had enough of us already. And after that we took it to Los Angeles, after that we took it to New York City. In New York there was couple hundred of us that first year, now there’s like 40,000,” said Schmitt. As the event started to grow in size, it also shifted from fun nights of mischief, to day long bar crawls filled with excessive drinking. This has caused the event to gain a bad reputation from city officials as well as local law enforcement. The bad rap that SantaCon has been receiving has prompted event planners to try to take matters into their own hands. They have started taking strides to improve the image as well as the essence of Santacon as a whole. One of the individuals who has tried to steer the event back in the right direction is Tom DiBell, who has come to be known as Santa Tom. DiBell has brought it upon himself to help navigate the toy drive that has become a part of SantaCon in recent years. The toy drive this year is officially run by the San Francisco Fire Department, in conjunction with SantaCon SF and helps deliver brand new toys to children who otherwise wouldn’t get anything for Christmas. “We’re trying to make sure that as many people as possible come bring a toy, bring a new unwrapped toy and give it to the San Francisco Fire Department,” said DiBell. DiBell along with the SFFD have come together to help create a more positive environment for this event to receive better publicity. With the toy drive associated with it, event planners hope that SantaCon can be thought of as more of a positive event, and one that isn’t just thought of as a giant bar crawl that destroys the city for a day and doesn’t do the community any good. “It gives people an opportunity to not only have fun and do what they do, and safely of course, but also be able to support their community and give back to the kids that need it the most,” said Alex Rashean, a firefighter candidate who was helping the SFFD with the toy drive. 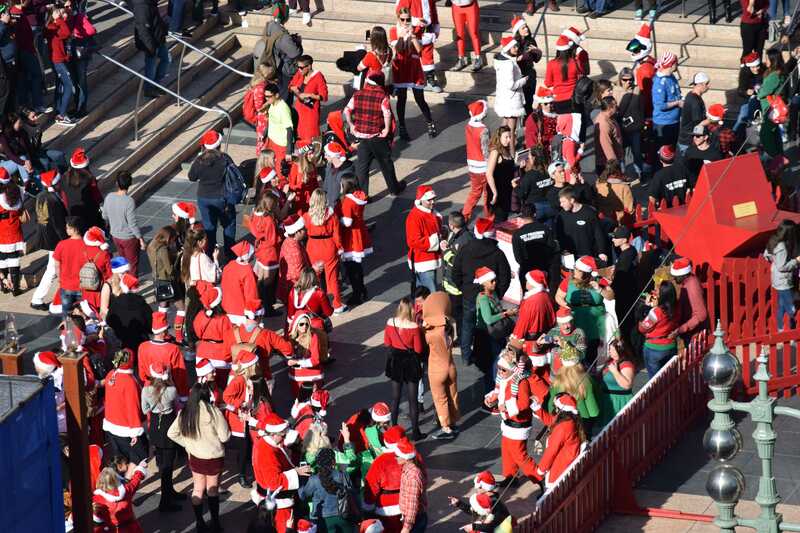 Overall, SantaCon has evolved immensely from what it originally was twenty-four years ago. What started out as a spontaneous idea from a group of friends has evolved into a worldwide event that brings thousands of people together in one location dressed as the most popular figure of the Christmas holidays. While it can become hectic, and certain people may end up spoiling the day for the rest of the event goers, Santa Con is supposed to be an event that brings people together for a day of fun during the holiday season. Coupled with a good cause like the SFFD Toy Drive, the event seems like it will be here to stay, despite city officials constantly trying to disregard the event as an official one. 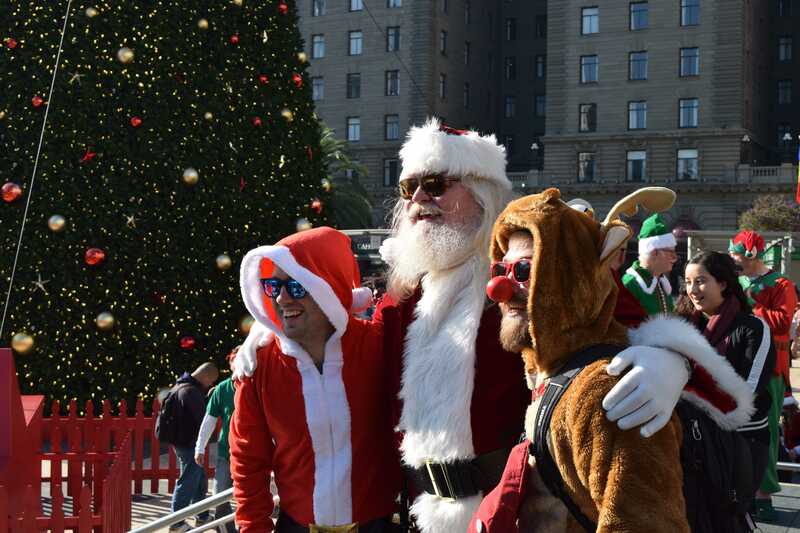 “It’s a charitable event and also a chance to get out on a pretty day and socialize and meet some new friends,” said Karla Nichols, who officially celebrated her first SantaCon this year.